LifeSpan makes a number of great treadmill desks and the TR1200-DT5 is hands down their most popular model. With workout tracking capability and a good warranty, this one's a great choice for those who like to work while they work out. 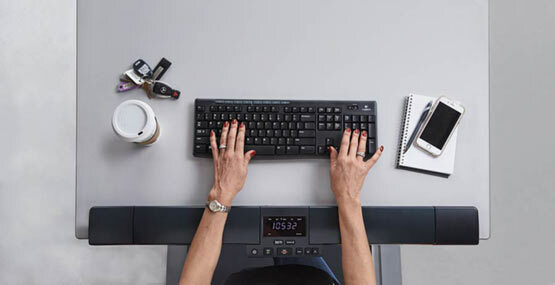 The DT5 is a combination treadmill and desk, with the console built right into the armrest providing workout metrics such as calories, speed, steps, time and distance. Desk Height: 41" to 55"
Dimensions: 68.5" x 29"/ 114 lbs. 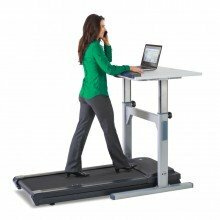 Take a look at this popular LifeSpan treadmill desk on sale now! LifeSpan has the most extensive line of desk treadmills in the industry, with a total of 8 last time we checked. Five of those models come with the desk, and three are under desk treadmills, meaning you provide the desk yourself. The TR1200-DT5 is their most popular "desk-included" model, and it has received great reviews from both experts and users due to its features and affordability. The treadmill portion has a nice sized, 2-ply belt with 6 independent compression shocks to minimize impact. The motor is a quiet 2.25 HP Continuous Duty one which easily supports the max speed of 4 mph. The desk is composed of 1" thick composite board with plastic side rails. There is a padded armrest built into the desk which contains the basic console with your workout feedback. You can adjust the height from 41" all the way up to 55" so it will fit any size user. You can keep track of your steps with the built-in Intelli-Step technology, and there is a safety mechanism in place which disables the treadmill if you are not actively walking on it. As far as technology, you can track all of your workouts via Bluetooth and sync them via the Active Trac app to Apple Health and Google Fit, two of the most popular fitness apps on the market. You can also share your info with others via Facebook and Twitter. The TR1200-DT5 treadmill desk is a great choice for those who want a well-built machine that they can use while they are working, without spending a lot of money or sacrificing basic features. If you're looking to burn up some calories while you are busy at work, the TR1200-DT5 is a great choice. If you already have a desk or work station that you can use, take a look at the DT3 model which is just the treadmill itself. 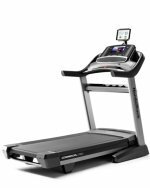 Either one is a good option under $1300, which is a great price for a solidly constructed treadmill, a nice sized deck and Bluetooth technology all in one.